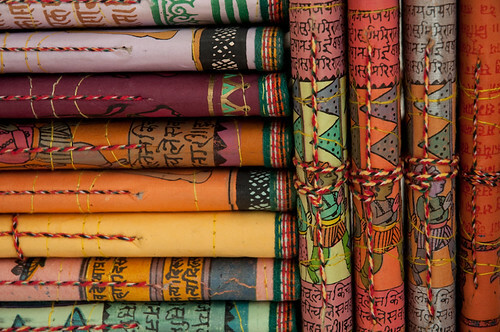 Indian Travel Journals, a photo by Birgit Deubner on Flickr. … when your mind wanders or your body travels then having a journal can be one easily accessible way of keeping yourself grounded. However I often don’t follow my own advice. So right now I am in Italy, staying near Venice, teaching English and feeling especially ungrounded. My yoga mat is rolled up in the other room and I haven’t put pen to paper in a very long time. Do you think it might be a good idea to make a new month resolution every month of the year and replace those with the annual ritual of making a New year resolution? What would your resolution be today? Previous PostEscaping from oneself / Sharing viewpoints.